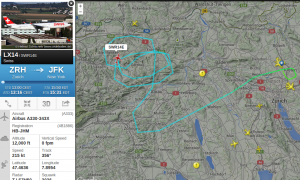 SWR14E is holding over GIPOL for fuel dump after bird strike on takeoff rwy 16 (cleared VEBIT 3 SIERRA). Due to the missing fuel dump equipment the aircraft was circling for more than 3 hours to burn some fuel before landing on rwy 16 again. During the whole “incident” the pilots did not declare emergency (squawk 7700), nor “Pan Pan”. The co-Pilot simply reported “vibrations” caused from engine 1 and was busy to omit Cumulus buildups, not shutting down engine 1, as it seemingly has not been damaged. LSZH DEP: do you request to remain on the frequency or for the next one for further climb? LSZH FINAL APP: SWR14E that is copied you have no speed restrictions and is FL120 still fine or would you like to descend? LSZH FINAL APP: Wie bitte? LSZH FINAL APP: Laufet bi oi no beidi Triber oder haend ihr jetz dr eint abgstellt? SWR14E: Wie gseit hr haend en Vogel gfunde gaellet uf dr Pischte oder Teili? LSZH FINAL APP: Mehreri Teili vo Voegel!